Prologue. This is part of the “Urban Discoveries” series, in which we seek and discover interesting and well designed places to eat and drink around Europe and especially in Vienna. START GAME. 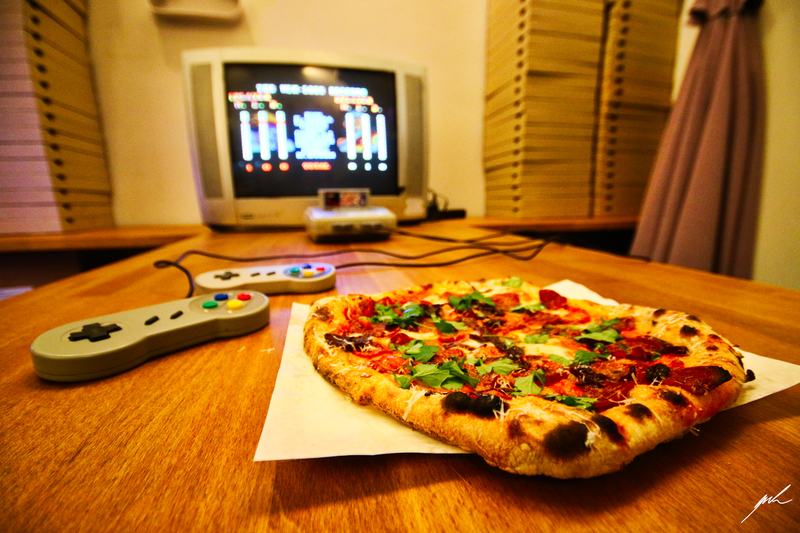 You are in the center of Vienna, walking down Mariahilferstraße and suddenly you see an endearing sign of a Pizza with a Super Nintendo inside the room. You decide to jump in to the tasty world of BROS. PIZZA. 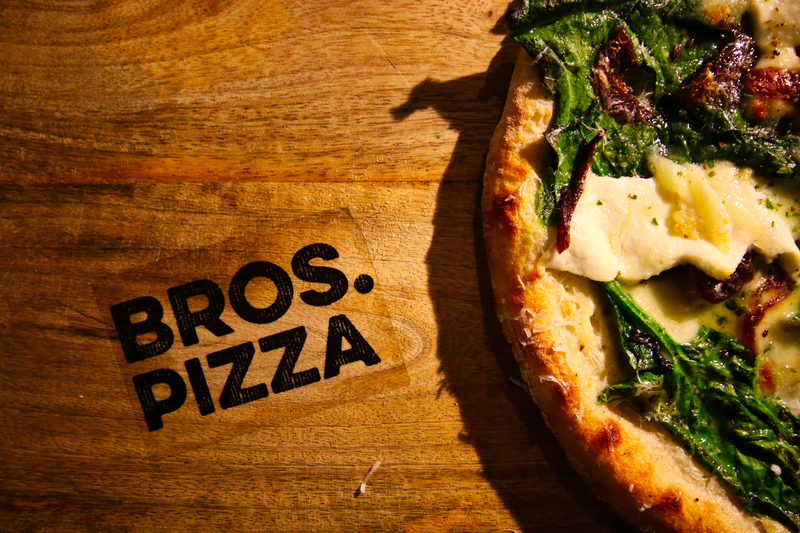 The Pizzeria started a few years ago as a project of two friends deciding to work together – hence the Bros. in the name. 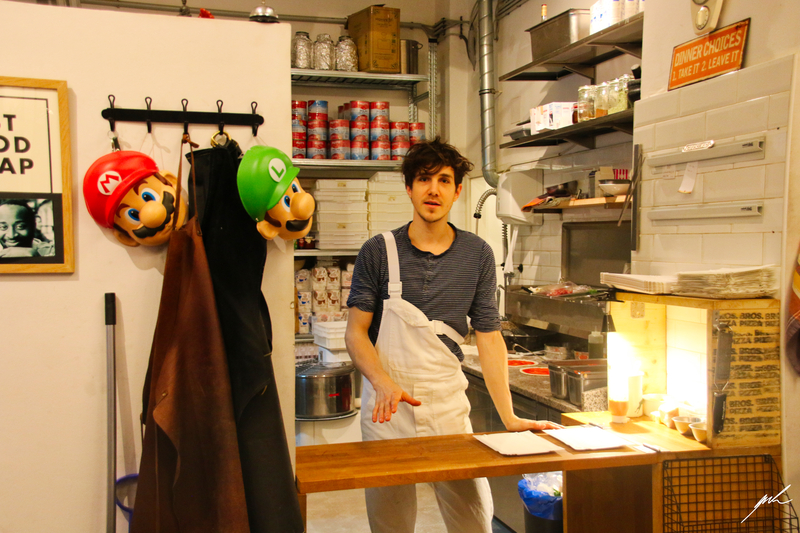 Legend has it when they saw the place with many ventilation tubes on the ceiling they thought of Super Mario and they came up with the video game theme of the restaurant. 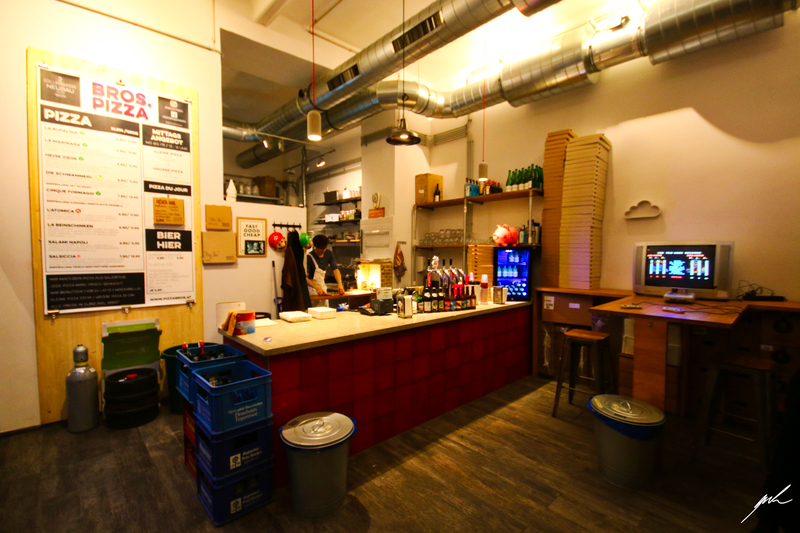 At Bros. Pizza you order your meal at the bar, either for take away or for dining inside. There is a choice of around 10 pizzas, sometimes with changing additions. 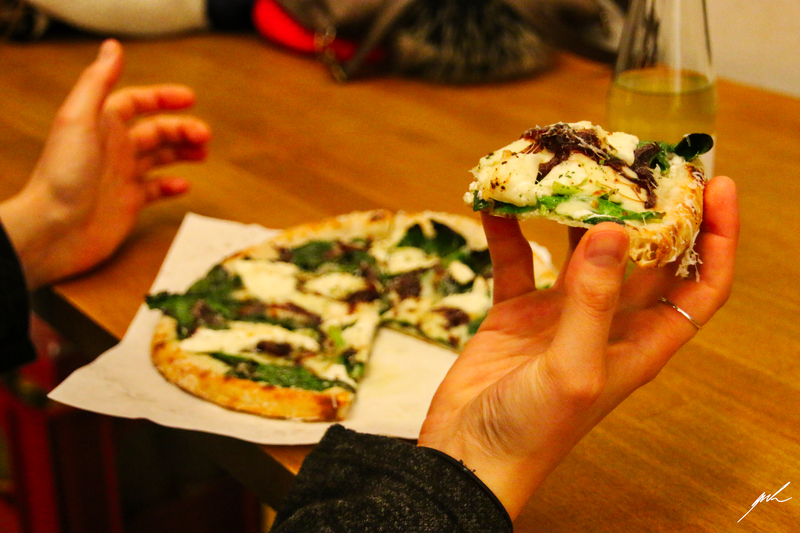 We decided for “L’Atomica”, a pizza with a hot toping consisting of Spanish chorizo, mozzarella cheese, caramelised onions and Red Eye hot sauce and for “Hot Goat” also called Pizza Bianca with spinach, mozzarella, goose cheese and pecorino. Both of them were delicious and crisp, the hot one having a nice spicy flavour to it. For drink we just ordered soft drinks this time around, but there is a fine choice of craft beer from the “Brussel Bier Project”. During the waiting time (which usually is not very long) you are invited to play Super Nintendo, it’s not just there for decoration – indeed it is working actually! The available games are changing but when we were there we could play Street Fighter during the waiting time and after the meal. What a great idea! There are also other nice easter eggs referencing video game culture and especially the Super Mario Bros. in the room – just keep your eyes open. BROS. PIZZA is open daily from Monday to Sunday from 12:00 to 15:00 and again from 17:00 to 21:00 and on Sundays from 12:00 to 20:00. 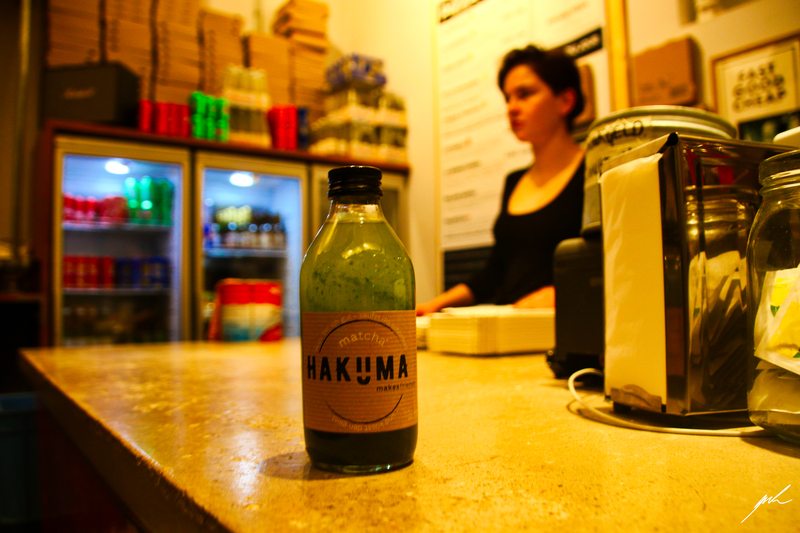 You’ll find it at Zollergasse 2, close to U3 Neubaugasse. For more info check out their Facebook page.